THOUSANDS LESS THAN THE COMPETITION. 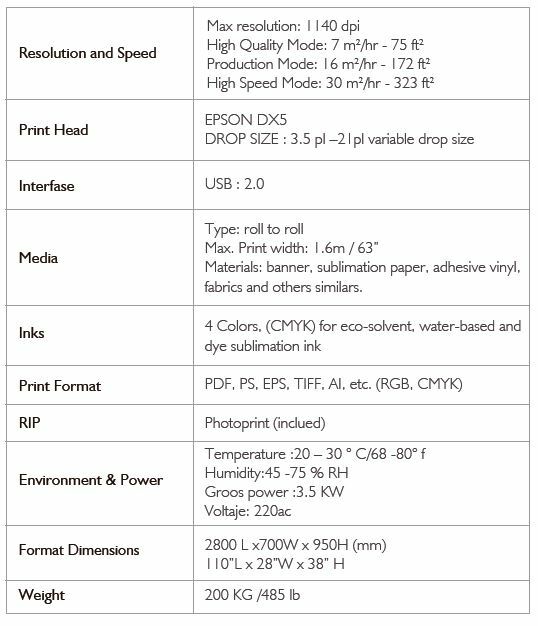 Here is the cost-effective wide format printer you've been waiting for. You get all the quality and the fastest printing speed for the least amount of money. Epson head and Mutoh platform - the best in the business. The RIP software is included! - Call us for a deeper discount of delivery, ink, paper, set up, and training for only $13, 999.00. 20 pinch rollers to provide accuracy in the media movement.The innovative design of the pinch rollers assure stability for large printing Jobs. Provides continuous ink feed for high volume printing, allowing the user to refill the ink on the fly. Printer has pre-heating, platform heating and post heating to prepare. Infrared heating is optional in this system help prepare the material to get the best printing quality. Platform vacuum system helps keep the material flat to ensure the best printing quality and avoid print head scratching the material. The machine uses a capping, wiper and cleaning pump to maintain the print head in good condition. Printer is equipped with a take up system to rewind the print out. The printer uses a variable drop print head and feather option to provide smoothness and high quality. Digital Temperature Meter with carrying case and wire-type probobe. Extended Temperature probe for the digital temperature meter. FDC Sign Vinyl Sheets 12" x 12"